They certainly are beautiful butterflies. The upper surface may have patches of blue, red, green, or yellow, while the underside shows an elaborate design of swirling lines and dots. Males have powder-puffs of “scent hairs” protruding from the top surface of the hind wing; these produce a seductive scent used in courtship. 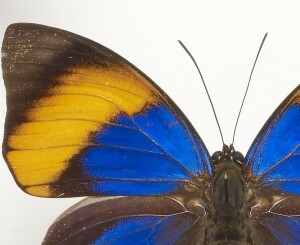 High-flying canopy butterflies, in the wild Agrias are most easily caught in traps baited with rotting fruit. Their early stages and host-plant affinities are, for the most part, not well known. 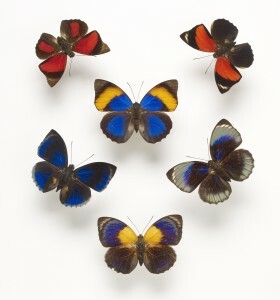 Learn more about butterflies and their relatives in a visit to the new Brown Hall of Entomology, a part of the Cockrell Butterfly Center– a living, walk-through rainforest at the Houston Museum of Natural Science. Previous Post Question for the Curator: Did Leonardo have a Crop? Next Post Happy Birthday Year!